It’s the holidays again, Christmas decoration started right after Halloween as well as the shopping be it a black, cyber or coupon. Rushing from store to store to find all those special somethings (sometimes for people we hardly know). Have we lost the spirit of Christmas? It’s a confusing world. For me the holidays are a time for friends and family, a time to catch up, a time to share stories and if you’re at my house… food. During this season friends and family just drop-in and on those days we create a cheese plate or pull out some of the baking I might have done. But sometimes I have a day to prepare, so I love to make something special, something you won’t get everywhere, or I might fix these to take to a party if I really want to create a wow factor. easily found in the grocery and is usually a medium ground corn although you could use the grits you have at home just make them thick so they set up well as they cool. 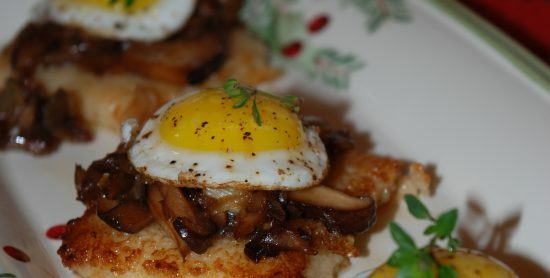 I top these with Quail eggs (yes you can get them at a new local Belmont grocery) for two reasons. importantly if cooked correctly the runny center of the egg mixes with the mushrooms and polenta to create a decadent mouthful sure to impress. Boil the polenta per the instructions depending on the grind (Medium or Coarse) season to taste and adding butter or a bit of cheese if you desire. Make sure to cook this down to a thick consistency so it will set well. While this is hot pour onto a greased jelly roll pan let cool then cover and refrigerate. The polenta can be kept for days prior to the next step as long as it stays chilled. For the mushrooms cut into ¼ inch dice. I like the Maitake mushrooms because they are so tender and delicious but any flavorful mushroom will work. Sauté the onions and garlic in butter till translucent add the mushrooms, Marsala, soy sauce and white pepper. Cook uncovered to reduce the sauce. Cut the cold polenta into squares (or rounds if you prefer but that creates more waste) and lightly pan fry them on each side to add just a bit of crisp to each side of the cake. The quail eggs cook just like regular eggs but very quickly so make sure you have everything else done and you can focus just creating perfect sunny side up eggs. Cook them till the whites are firm, but the yolks are runny. I cut mine into nice little rounds but you can serve them rustic as well.